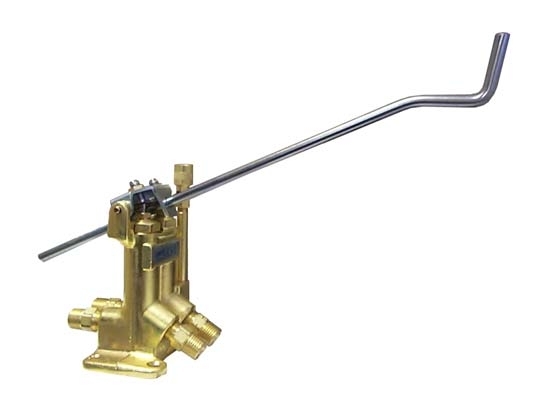 The Carlisle Mechanical Gas Savers allow the operator to hang a torch from the arm, shutting off the gas flow to the torch and therefore saving gas when the torch is not needed. Models are available with a pilot flame on the unit so that the torch can easily be relit when needed. Depending on the model selected, Carlisle Mechanical Gas Savers can be used with natural gas, propane, butane, methane, acetylene, or mixed gases and oxygen, air, or water. The Mechanical Gas Savers are available in four different models. The first model is the W-101-E. The W-101-E is used with Acetylene. The model W-102-EI is used for inert arc welding operations. This model allows for positive shutoff of both gas and water and is not available with a standing pilot. The model W-103-ELP is specifically setup to run with Natural Gas. The W-104-P is used with propane at 4psi or more. This unit uses special seals that are designed for use with propane gas.